Does your family have a history of selfless service? Are there members of your family that live for the hunt? The camouflage pattern is timeless and we are now proud to introduce you to our complete line of camo baby bedding sets. 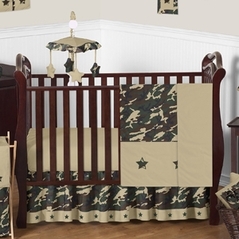 These camo crib bedding sets are sure to make the most of your nursery space. 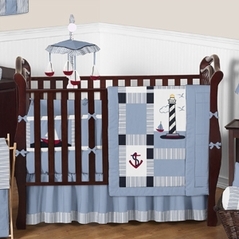 Give your little tot the "protection" they need with our camo crib bedding sets. Children’s Camouflage bedding is perfect for any little soldier or soldierette's nursery looking for a military inspired stylish theme. Our baby camo bedding patterns are available in pink camo, blue camo and green camo crib bedding. Our kid’s camo bedding is available for cribs, twin, and full/queen size bedding sets for both boys and girls. And here at Beyond Bedding we only carry the finest quality bedding sets from reputable manufacturers such as Sweet Jojo Designs. And make sure to pick up a coordinating bed skirt, matching camo baby bedding hamper, or other accessories to complete your rooms theme. You might be surprised to learn that camouflage is a hot new trend for baby bedding. Traditionally used by the military and hunters, this classic pattern has made its way into the bedrooms of babies! 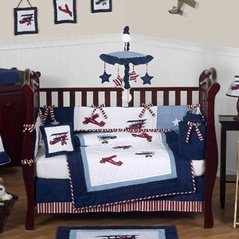 And you don’t need to have a family member in the armed services to love this unique choice for your baby’s nursery. Create a room that accurately reflects your personality so that you can picture spending countless hours there with your little guy or girl. Now that dads are taking a more hands-on role when it comes to parenting, give their masculine persona a chance to shine in your baby’s room by choosing a baby camo bedding set. 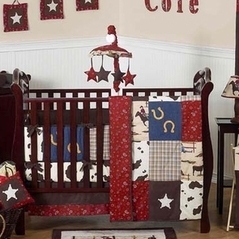 Although camouflage is meant to keep things hidden and out of sight, you will definitely want to show off your baby bedding if you choose one of these adorable camo crib bedding sets from Beyond Bedding. 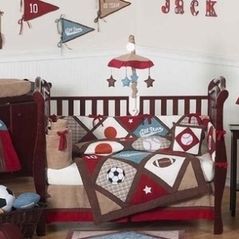 JoJo Designs has created a whole line of baby bedding based on the ever popular design found on military fatigues. 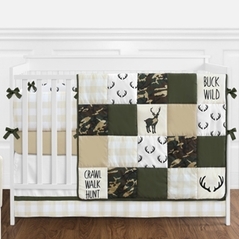 Whether you have a family member in the service, or you are a family that loves to hunt, or you just find yourself drawn to the unique look of camouflage, consider decking your baby nursery out with a bedding set in this eye-catching pattern. Are you expecting a baby girl and looking for a great compromise to make your baby nursery feminine but appealing to your husband? You probably wouldn’t envision your baby girl sleeping in an olive drab nursery, but thankfully JoJo Designs has come up with the perfect solution. Pink camo baby bedding is an adorable option for any baby girl, whether or not you’re a military family. The pink and khaki color palette keeps her room looking fresh and feminine, while the camo print adds a funky edge. The pink camo pattern is a visual stand-out, so stick to solids in neutral shades when it comes time to add a splash of color to the walls of your baby nursery. White walls would be far too harsh of a background for the bedding, but the khaki shade used in the pattern itself is a beautiful option for a wall color. By using a paint color that matches your bedding, you will tie the entire room together without creating a busy overall effect. Wallpaper is time intensive and can be tricky to install, and have a solid background in your baby nursery is always the best route when you have chosen a dramatic print for your crib. Add feminine touches around the room, and plenty of fuzzy stuffed animals to create the perfect balance of stylish and sweet, and your pink camo nursery will be complete! If you’re looking to create a military inspired look for your little soldier, the Green Camo Bedding Set is just what you need. This bedding set comes in traditional camouflage colors to create a perfect military inspired look. You might think that dark colors will look odd in a baby nursery, but if you style the rest of the room accordingly, baby camo bedding can actually appear quite modern and playful. The rich tones of olive green, brown, and camel will look gorgeous on baby furniture with a dark wood finish. Add a little visual contrast to the rich colors of the bedding by choosing a lighter wall shade that is still within the same color family. You can go with a paler green or a light tan color, that will play off the earth tones found in the bedding pattern. Play up the star detail in the accessories and comforter by hanging large stars on the walls. You can easily find materials at your local craft store to make a project out of it, and paint them in colors that match the camouflage print. If you want to pick something a little lighter, there is always the Khaki and Blue Camo Set that gives the same distinct look of camouflage in a cheery color scheme that is easily complimented by a variety of wall shades, like pale blue or a lovely tan.